Last Week in Review: Home prices continued to rise. Did GDP and PCE? Forecast for the Week: Will the June Jobs Report sparkle or fizzle? View: Pocket more cash when you book your next plane ride. “A house with love in it is rich indeed.” Nat King Cole. Families may find themselves living on love as they invest more on increasing home prices. 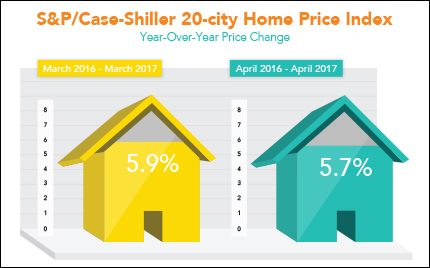 The S&P/Case-Shiller 20-City Home Price Index saw another gain of 5.7 percent from April 2016 to April 2017. Price increases are due in part to limited supply of housing in many areas across the nation. Plus, low home loan rates are inspiring people to purchase homes or upgrade their homes, taxing limited inventory. The overall economy performed better than previously reported in the first quarter of 2017, according to the Commerce Department. The final read on first quarter Gross Domestic Product came in at 1.4 percent, above the second read of 1.2 percent, and well above the first read of 0.7 percent. Consumer spending, which accounts for nearly two-thirds of all economic activity, got a nice boost, rising 1.1 percent from 0.6 percent, though this is still a low level. Consumer inflation remained tame in May, as the Core Personal Consumption Expenditures (PCE) was in line with expectations at 0.1 percent. The Core PCE reading excludes volatile food and energy costs. Year over year, Core PCE fell to 1.4 percent, well below the Fed‘s target range of 2 percent. Inflationary pressures can reduce the value of fixed investments like Mortgage Bonds and worsen the home loan rates tied to them. At this time, despite a volatile week in the markets, home loan rates remain just above historic lows. The Jobs Report could launch fireworks in an otherwise quieter week. Stock markets close at 1:00 p.m. ET and Bond markets at 2:00 p.m. ET, Monday, July 3. Markets will be closed Tuesday for the July 4th holiday. The ISM Index will be released on Monday followed by the ISM Services Index Thursday. Though not an economic report, the June Federal Open Market Committee (FOMC) meeting minutes will be released Wednesday and could spur volatility. The onslaught of employment data begins Thursday with the ADP National Employment Report and weekly Initial Jobless Claims. Look for the June Jobs Report on Friday, which includes Non-farm Payrolls, the Unemployment Rate and Hourly Earnings. As you can see in the chart below, Mortgage Bonds lost ground in recent days heading into what should be a quiet holiday trading week. Going the less expensive route will still get you there, but with money to spare. For domestic travel, watch for steep sales between Labor Day and December 15 (except over the long Thanksgiving weekend) and then after the holidays until February 15. “There are no school vacations and people are traveled out,” says George Hobica, of Airfarewatchdog.com, whose site sends out alerts when airlines launch sales. Tuesday, Wednesday and Saturday are typically the cheapest days to fly domestically. Check fares from other airports. For international flights, watch for airfare sales at hubs near you. You could drive or take a bus there or book airfare on a separate flight, making sure to leave plenty of time to catch the international flight (if the tickets are separate, you’re on your own if you miss your second flight). However, smaller airports sometimes have international bargains that larger ones don’t, says Hobica. He recently spotted flights to Paris from Flint, Mich., with one stop, that cost half the price of nonstop flights from Detroit. A similar trick works for far-flung destinations that would be outrageously expensive to book with a single airline. Say you want to go to the Greek Islands. Flights from the U.S. to one of the islands typically cost at least $1,400 round-trip. Instead, grab a sale round-trip fare to Athens (often less than $600), plan to stay a night or two there, and then fly to the island of your choice on a budget airline such as Ryanair (less than $100), says Scott Keyes, of ScottsCheapFlights.com. Reprinted with permission. All Contents © 2017 The Kiplinger Washington Editors. Kiplinger.com.